IABM has announced the shortlisted candidates for its highly-prized Design & Innovation Awards – widely regarded as some of the most coveted honors in the industry because of their truly independent, expert-driven judging. Nearly 80 entries have been received this year. After scrutiny by a panel of 40 independent industry expert judges the final winners will be announced at the IABM Awards ceremony on Saturday 10th September at IBC. 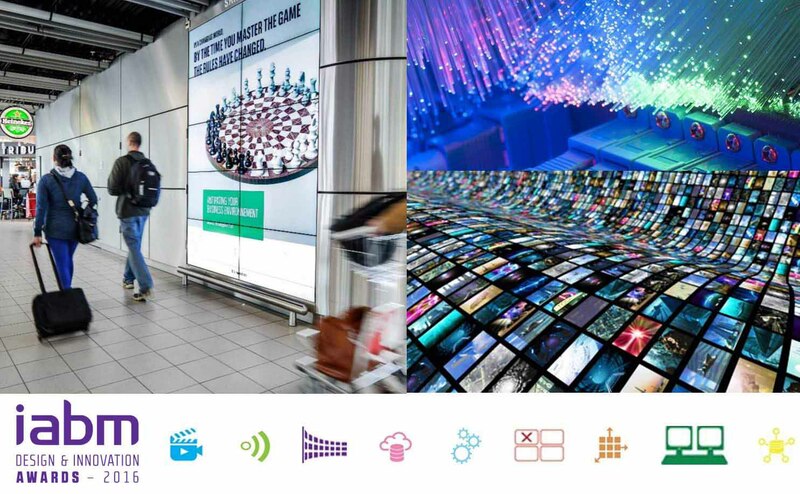 As of today we feature 77 companies and their approach at IBC2016. This list is continously updated until IBC opens on September 8th in Amsterdam. At this year’s IBC Broadcast Solutions GmbH will showcase two 4K OB Vans at their outdoor stand O.D02. The German System Integrator and OB Van specialist will present two examples of the successful Streamline OB Van product family: a Streamline S8 4K OB Van, built for NEP Germany and an Alphaline 12 4K OB Van, built for South Korean Broadcaster SBS. With the two OB Vans visitors have the chance to touch and feel two examples of the pre-configured Streamline Product Family that come as 4K versions. By providing these OB Vans as a product Broadcast Solutions underlines their approach to deliver high-class production tools in the shortest time possible and in 4K. For the German-based System Integrator developing and building 4K OB Vans is a daily business. TV Skyline, one of Germany's largest television production service providers, has chosen Leader's LV5490 4K/UHD/3G-SDI/HD-SDI/SD-SDI waveform monitor for integration into its new OB8 4K outside broadcast vehicle. Combining radical new technology and innovative structural layout, OB8 provides all the resources needed for ultra-high definition coverage of sports, stage events and electronic field production. TV Skyline further owns special cameras including Qube:Cam, Sports:Cam, InGoal:Cam and a premium-class flight-pack system, developed in-house. In parallel with the BBC’s coverage of the UEFA Euro 2016 Championship in France in June/July 2016, Suitcase TV Ltd, a leading broadcast technology developer, successfully trialled an all-IP remote production of the championship using its Iphrame Remote centralised production system. The overall Iphrame system provided video and audio switching/mixing of remote sources in Paris controlled by operators located back at the BBC Sport production centre at MediaCityUK in Salford. Unlike other remote production architectures which bring back multiple source feeds, Iphrame performs high-res mixing onsite allowing the bandwidth of the IP-link to be significantly reduced. Low-resolution proxy feeds were generated for all sources which were transferred over a layer 2 IP link to operator workstations and multiviewers at control positions in Paris and in Salford. Bigélius Produktion is a well-established premium and high quality AV company mainly focused on the Swedish and Nordic live events market. The company has its roots in audio and has been a partner of Mediatec for some time delivering excellent solutions to their clients. The company has offices in Enköping and Stockholm, Sweden. The acquisition will strengthen Mediatec and its reach across Sweden, the Nordics and Europe. “Bigélius Produktion will be a great addition to us and will strengthen our presence on the Swedish and European market. We see a large opportunity for growth in the Nordic region as well as in Europe. By connecting to C-Cast, EVS’ scalable, cloud-based video-on-demand editing and distribution platform, deltatre’s enhanced video players enable live multi-camera content to be instantly enriched with data and distributed to connected audiences. With its new Syndication operation of C-Cast, digital media holders using the C-Cast platform can grant regional right holders, clubs/stadiums and sponsors access to content shared with C-Cast Central. This lets them quickly create customized, live Video On Demand (VOD) packages featuring content of interest to their specific audiences. Using an expansive publishing toolset and C-Cast API, digital media crews can easily manage personalized content collections for publishing on any partner or customer app, delivering an entirely new fan experience. It was the second consecutive one-two finish for Hall and Dolderer, and the Australian is whittling away at the overall lead that his German opponent has held since April. The result bounced Hall, who finished second on the World Championship podium in 2015, just ahead of 2008 World Champion Hannes Arch on the leaderboard, and while neither pilot can overtake Dolderer’s substantial points advantage in a single race alone, there are two stops left in the season. The drama will commence with the Red Bull Air Race debut at the Indianapolis Motor Speedway, followed by the season final in Las Vegas; and American Kirby Chambliss, currently at fourth overall, is also looking to make a move in his home races. All Eyes on SPORTELAmerica 2017! The SPORTEL Crew has worked hard to develop more and new opportunities for you in the territories of the Americas. After recent events in Brazil, the world has become more aware of new sport opportunities and properties Latin America has to offer, but also the seemingly endless variety of sports out of the Americas makes this convention one of the sexiest of 2017! SPORTELAmerica is the network platform for the entire Americas that unites the Asian, European with the North, Middle and South American sports marketing and media industry. The American sports market is one of the most versatile in the world, showcasing many of the most exciting sports leagues in the world but also groundbreaking technologies. In PURE LIVE 2016 you find detailed descriptions of 24 new 4K/UHD OBVans from all around the world: Australia, China, Canada, Europe, United States, in particular AMP VISUAL TV, Arena, Clark Media, Croatel, Dome Productions, Euromedia, Gearhouse, Hunan TV, JSBC, Mediapro, NEP, Telecenic, Timeline\TV, TopVision, TV Skyline, TVN, Videohouse. PURE LIVE also presents portraits of international system integrators, rental facilities and production houses as well as case studies and reports highlighting the areas of video, audio and lighting in TV Live Productions for sports and entertainment: UEFA EURO - Adele - Le Mans - Royal Opera Stockholm - Formula E - Montreux Jazz - Trotting - PAC-12, to only name a few of the Highlights. You can get your copy for €25 at IBC on our booth on the walkway between Hall 7 and Hall 8 or online in our shop for €25 + shipping. German rock legends The Scorpions celebrate 50 glorious years of being ultimate heroes of heavy metal. 2015 actually marked the anniversary of their formation … BUT. .. Insatiable public demand and a band that clearly love the buzz and drama of hard rocking live performance … have simply not stopped touring! Associate LD and lighting operator Manfred Nikitser from MANIK Show Lighting, Vienna, is running the lighting for the current touring schedule together with Rainer Becker. The summer shows are a mix of festival and own-headliners, 90% of the time using local productions matched as closely as possible to their generic spec. Robe’s BMFL Spots are among a number of primary moving light fixtures on the rider that Manfred is happy to accept from local vendors. Entertainment engineering specialist WIcreations was asked to create an innovative solution for the current Massive Attack tour. The video design, created by United Visual Artists (UVA) - needed a full horizontal section in the middle of a 14.4 metre wide by 6 metre high flown Roe MC7 LED screen - to protrude from the rest of the surface by half a metre. This was to make specific text statements, facts and figures being displayed really stand out. Massive Attack are known for their political conviction, raw, visceral lyrics, provocative subject matter and dedication to producing cerebral and thought-provoking shows exposing official lies, twists and economies of the truth … wrapping it up in an entertaining and emotive live experience. Kitzbühel, Austria’s best ski resort and hot spot for international sporting events such as the Hahnenkamm race, the snow polo world cup or the tennis ATP world tour, is also attracting a lot of attention with cultural events such as the Kitzbühel music festival. This is especially due to the large and personal commitment of Thomas Rass, owner of Rass & Dorner GmbH. He lured the A-Team of European folk music to the so-called “Gamsstadt” Kitzbühel, while at the same time taking care of the technical realization of the event. The 4th Kitzbühel music festival took place from August 18-20, 2016. Amongst others, the festival featured Oesch’s die Dritten, Francine Jordi, Ross Antony, Johnny Logan, Hannah and Vanessa Mai as well as superstar Andreas Gabalier, who had sold out Munich’s Olympic Stadium with 70,000 fans shortly before. Firehouse Productions, the New York/Las Vegas Audio and Communications vendor, has for the first time selected Clear-Com® FreeSpeak II digital wireless intercom to connect the live production crew during the 2016 MTV Video Music Awards (VMAs), which aired live from Madison Square Garden (MSG) on Sunday, August 28, 2016. The VMAs featured performances, interviews, red carpet coverage and extensive social media exposure with A-list music industry stars. Despite the massive viewership of the VMAs, expansive zones of coverage and numerous 2.4GHz devices in use simultaneously, Firehouse Productions was confident that FreeSpeak II would cover the entire MSG venue thanks to 20 integrated Transceiver Antennas and 25 wireless beltpacks. NewTek introduced the NewTek IP Series, a software-driven, modular video production system with virtually limitless access to video sources and video mixing options. Designed to work cohesively in an ecosystem, the NewTek IP Series is the first large production system designed for IP video while also fully backwards compatible with SDI; using separate scalable high-performance components for the mixing and control, input, and output of sources allowing virtually unlimited scalability. Video, audio, and control signals from these components are transferred digitally using NewTek’s Network Device Interface (NDI™) technology allowing multiple video systems to identify and communicate with any other system over a standard computer network. The result is a fully customizable IP workflow solution with the flexibility to handle the most demanding production needs. Video Europe, a film and broadcast production company based in London, chose the Brio for an audio console upgrade on OB5, its eight-camera HD OB truck. Built by broadcast systems integrator and equipment supplier WTS, OB5 has the smaller footprint required for central London productions such as film premieres, as well as Championship football and Welsh Premier League rugby matches. "The Brio console was replacing an older existing mixer, so the close coordination with Calrec, plus the early delivery of the unit to WTS, was a huge benefit in allowing us to install and integrate it seamlessly in time for Video Europe's job," said Andy Morris, Systems Supervisor at WTS. "The initial configuration of the console was simple due to the large touch screen and intuitive and familiar user interface. XT4K – practical and reliable live 4K production. The XT4K is a 4K production and replay server which uses uncompressed 12G SDI in and output ports and integrated IP I/O options to deliver new flexible ways to design production facilities’ infrastructures. The new UHD server will offer users the capability to grow with future engine software updates enabling even more flexible UHD/HD configurations through increased channel density options. XS4K – flexible IP media server for studio production. Optimized to enable a smart transition to an IP-connected studio environment, the XS4K is built with hybrid SDI/IP technology. The server is built with a flexible four channel 4K and 8 channel HD configuration which enables seamless ingest & playout multiformat content within studio operations. The demand for 4K Ultra High Definition production acquisition, workflow and transmission technology has thus increased since the first live trail productions back in 2014 (FIFA World Cup). Since then we have seen a substantial surge in 4K UHD live productions, especially in the past twelve months, which to some extent can also be contributed to the increased proliferation of 4K UHD TV sets in private households and resulting demand for more 4K UHD content. After the introduction of the UA80x9 & UA22x8 lens models, there was a popular demand for longer and wider focal ranges. The 4EVER-2 goal is to define and evaluate UHD-TV phase 2 technology, live and from end-to-end, in order to provide the best quality of experience. Paired with binaural spatial sound, UHD-TV phase 2 now offers the highest quality of experience achievable today. 4EVER-2 is a French collaborative project of nine academic and industrial partners: Orange, AMP Visual TV, ATEME, France Télévisions, GlobeCast, Highlands Technologies Solutions, INSA Rennes, TeamCast and Télécom ParisTech. 4EVER-2 has also established collaborations with international public and industrial research centres, and with numerous suppliers of TV production equipment and display manufacturers.